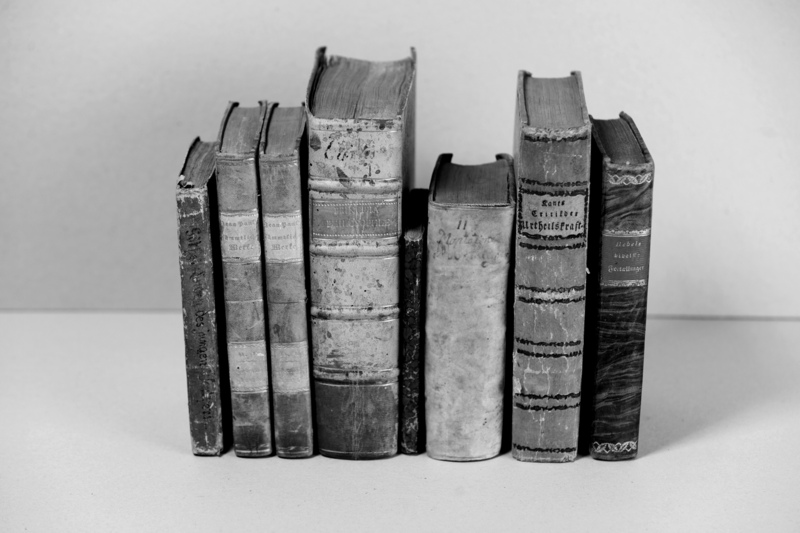 Kunsthall Trondheim´s first exhibition in 2014 presents Ulla West´s project Library of the Evil Spirit. The project takes its starting point in the writings of Thomas Bernhard (Austria 1931 – 1989) and what he described as ”a mobile library with the most important works of the evil spirit”. With a base in a selection of books, essential to Bernhard, Ulla West has compiled a temporary and open library as a part of the exhibition, encouraging the visitors to read. 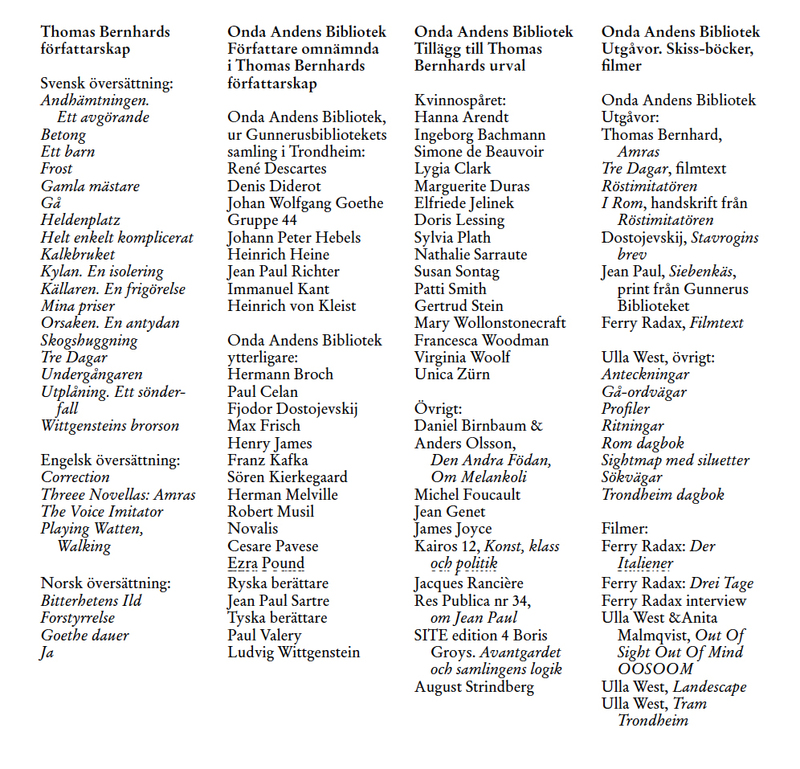 From this library the exhibition extends into a number of new works – photography, drawings, paintings, new texts and translations – produced during a residency period at Kunsthall Trondheim in fall 2013. Library of the Evil Spirit is a long term, on going and open-ended project. Ulla West follows Bernhard in his footsteps; in his texts and in his travels. She adopts some working methods and ideas, rejects others, walks alongside his texts for a while and makes her findings her own. She adds, most important – she adds the women, constantly missing in Bernhard’s oeuvre. To read Thomas Bernhard is without doubt an activity. A relaxed consuming of text is not an option. For one thing, he demands an active reader – you need to read as if it was your text and furthermore, you need to use your own voice, even if silent. The experience is rather one of talking then of reading, it´s a physical experience. It reminds of walking – the energetic and coordinated movements and the pure joy of it. These aspects of reading Bernhard are at the core of the project Library of the Evil Spirit. The artist uses the process of translation of texts as a form of close reading and appropriation. She binds the texts by hand and uses Bernhard book pages as notebooks and material for new works. 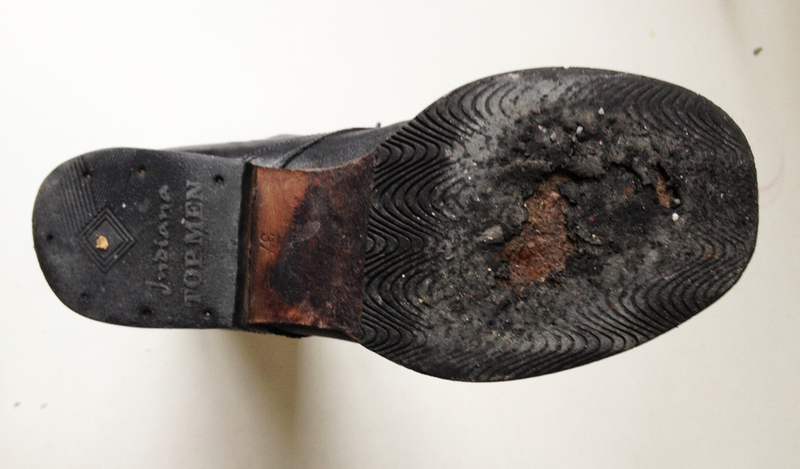 Fragments of texts, letters and words, which she extracts from Bernhard´s Walking (1971) form new texts – Ulla West´s way of reading is closely linked to writing, to the voice and the physicality of the body. 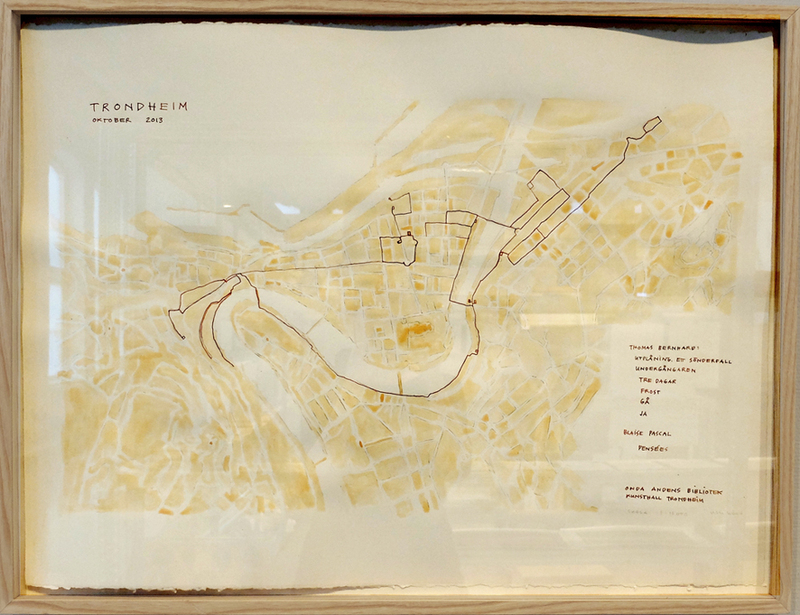 The artist´s walking in Rome, following Bernhard´s tracks, and in Trondheim, form patterns and new tracks, which result in maps that become the backdrop for the artist´s on going conversation with Thomas Bernhard. 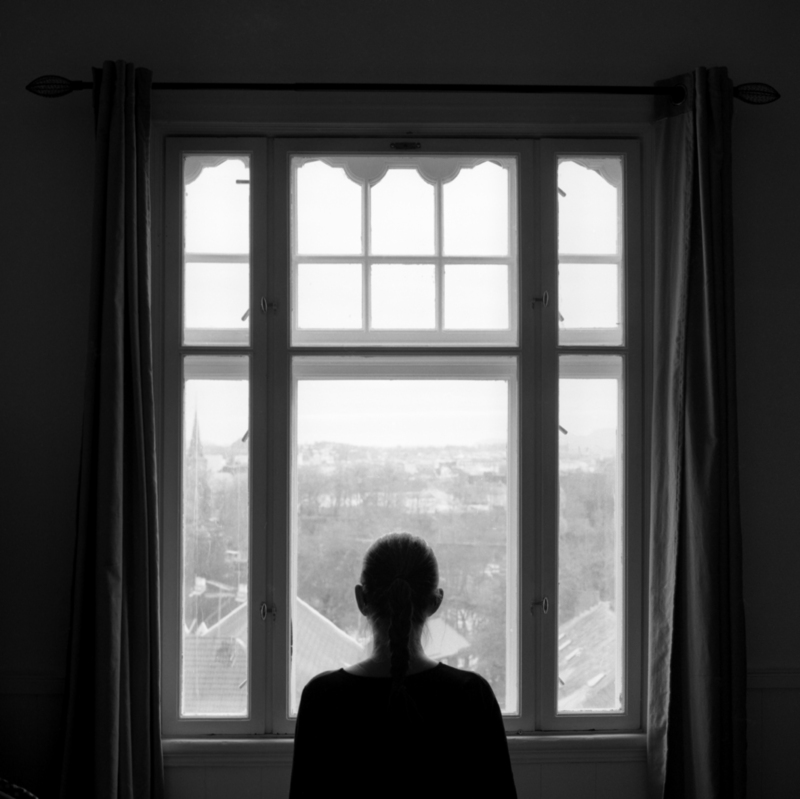 The physical aspect of the process includes the room where the writing and reading takes place – in a black and white analogue photograph (another physicality) the artist is portrayed in her room on the hillside in Trondheim, overlooking the city and the bay. Her days in Trondheim are structured and presented following the concept of Frost (1963), Bernhard´s first novel, in twenty seven diary notes, a new title in the library that will be followed of others from other cities.